ModEchoVerb is based on a popular reverb structure from the Eventide H8000 that brought about such presets as "Echo Space of God" and "Glorious Flange Canyon." It feeds the output of an infinite reverb into an infinite feedback delay and slathers on an extra helping of modulation. The modulation choices are H3000-type swept verb, flanging, or chorusing. 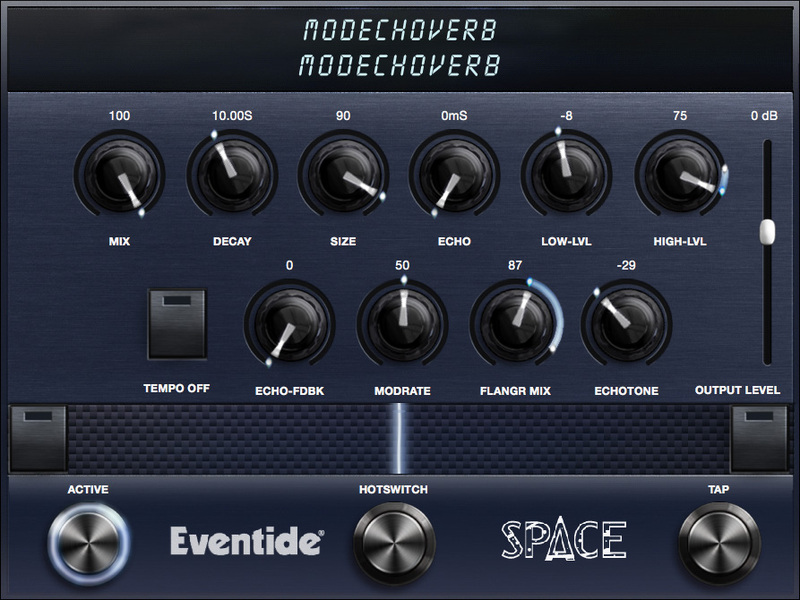 ModEchoVerb is incredibly versatile and can be used as a standalone reverb, delay, chorus/flanger, or any combination of the three. Have fun. select modulation type and depth: swept reverb [SWEEP], flanging [FLNGMX] or chorus [CHORMX]. The Middle Footswitch can be programmed to act on the loaded Preset as a programmable controller allowing the user to switch between the normal Preset parameter values and a programmed, alternate set of parameter values. It’s like having two Presets in one.